Looking to take a few fashion classes this fall? Retail math, social media, sustainable design practices or something more technical like sewing? FIT's School of Continuing and Professional Studies department offers a wider range of classes that take place during the evenings and weekends and are geared towards those that want to further their education. You can choose from certificate, credit and non-credit programs ranging from accessories design to business courses. For those that aren't in New York, the program also offers online courses. 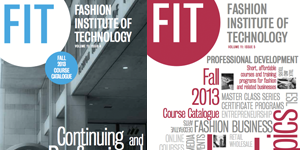 Download the catalog at FIT's School of Continuing and Professional Studies and learn more about what they offer.